The Business Men's Assurance Company Tower was designed by the Chicago Office of SOM. The 19 story office tower earned the Architects a First Honor Award for the American Institute of Architects. 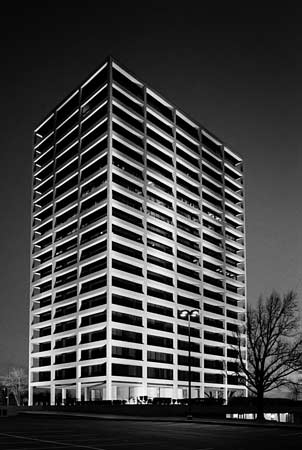 The building was articulated with a white marble clad frame and recessed panels of dark glass window wall. The marble cladding was replaced in the 1980's with white glass due to failure of the thin marble skin. The building was sited on one of the highest points surrounding the city and commands dramatic views of Kansas City Landmarks. More recently the building has been repurposed into luxury condominiums and renamed One Park Place.